Wedding Ceremony surrounded by fragrant roses and blooms in the garden overlooking the rolling hills and vineyards. Our service members get a military discount! Dodson Orchards is a barn wedding venue located in the rolling hills of the Ozarks, just about an hour south from St. Louis County. 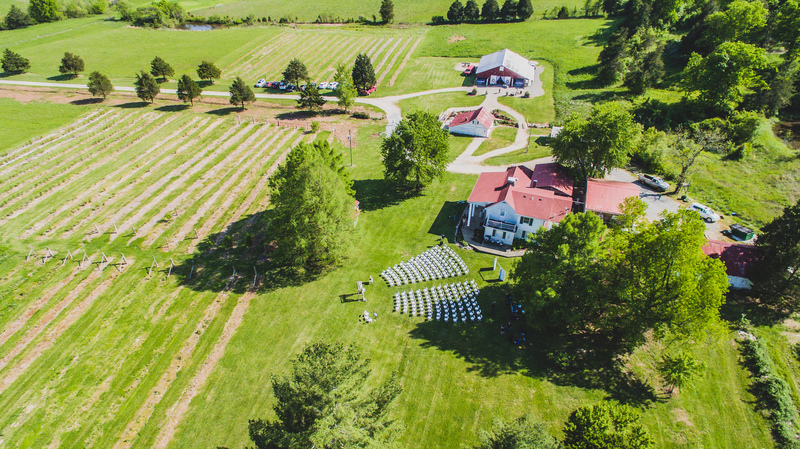 Not only do we grow apples, peaches, blackberries, and grapes, but we also provide a beautiful Barn Wedding venue for couples who are looking for a rustic barn wedding. Here is a brief description of our barn wedding venue and the many unique services and offerings you can find at this one of a kind wedding barn. Our Wedding Venue Rental is for an exclusive use of the wedding venue for 10 hours. During this time you can use the Bridal Cottage and Grooms Cabin to get ready on site and prepare for the biggest event of your life while we get the venue ready according to your specifications. You won’t have to worry about sharing the venue with anyone else for the entire day. Experience the moment everyone will remember overlooking the scenic landscape of the Ozark Valley as the wind whispers in the pines and nothing but blue skies stretch from horizon to horizon at this barn wedding venue. Or experience the magic of our authentic 100+ year old barn, surrounded by your loved ones as you start your new family. You and your guests will experience an unforgettably peaceful atmosphere where you and your guests can easily connect and develop new relationships. The orchard’s story is one of many lifetimes of dreams, struggles, and victories. An atmosphere that speaks to our American heritage and the story of us as a people and nation. It’s an atmosphere that can’t be imported, exported, or duplicated. It’s as unique as you are and as this venue invites you to become part of it’s history. When you decide this is for you, then you’ll be on your way to having the enchanted wedding of a lifetime. Dodson Orchards is a great venue, but YOU are the main attraction at this venue and the spotlight is all yours. We’ll work with your unique dreams and visions the create an environment that is completely you. Within this package you’ll receive 3 hours of 1 on 1 event consultation. We’ll work with you to find out your vision and our staff will be there to help you throughout the creative process. Finally our staff will fully decorate the venue so that your event looks and feels custom to you. You’ll have full access to our vast array of rustic chic decor, saving you untold amounts of time of money. In addition to decor we will provide you with 150 chairs and 20 buffet style tables, along with a compliment of other rustic and antique furniture pieces to use as accents and gift tables. Service here at Dodson Orchards goes deeper than the empty slogans or statements you’ll find anywhere. We take great pride in delivering your perfect wedding day dreams. staff will be here to assist you every step of the way before and during your wedding. Here at Dodson Orchards you are in good hands. You and your guests are in for a mouth watering treat here at Dodson Orchards! Far from the ordinary wedding dinners you may have experienced, the fare for your special day is prepared fresh and served hot, right here on the farm using local sources and only the freshest ingredients! You and your guests are going to enjoy a great tasting feast fit for royalty! Our staff will serve your guests buffet style in our serving area adjacent to the barn. You’ll get to have two incredible entrees, like slow roasted Hereford Prime Brisket, or Smoked Gouda Chicken Bechamel, or one of our many other choices. Choose any three side dishes from a large selection of complimenting dishes. Fresh salad, dinner rolls, and coffee, tea, and cold water.All set on a fully decorated table with linens, glass goblets, flatware, and table decor of your choosing. Compliment your event with bar service including open bar packages. If you would like to add some more authentic charm your guests will love. Then try a rustic pie bar! The pies are made fresh to order here in our kitchen from fruit grown right here and displayed beautifully. Full menus are available for your review! Your reception is going to be an amazing atmosphere where people can feel comfortable. A great place for two families to actually mingle and create new bonds that will in many cases be the first time many people meet. Be under the barn on the dance floor, under the stars, or maybe against the backdrop of a romantic bonfire. Your guests are going to have the time of their lives and you are going to be at the center of it all. Let the Honey Moon Begin! At the end of your night, the last thing you want is the stress of clean up. Waiting around and doing work isn’t what you had in mind for the end of your wedding night. Here at Dodson Orchards, we take care of all that for you. We’ll take care of closing it down. You take care of starting the rest of your lives together! Pricing depends on the number of guests, time of year, and other options you may want. Contact us today to learn more about our venue and to schedule your private tour.